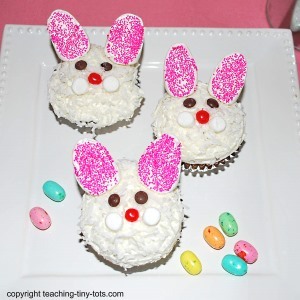 Toddler Recipes: Make Cute Bunny Cupcakes! Perfect for Easter! Sprinkle white coconut all over the surface. Cut one large marshmallow in half diagonally with kitchen shears. Dip the cut surface into pink sprinkles to make the inner ear. Using frosting or Wilton Icing, glue on eyes, nose, cheeks on face. Poke one pretzel stick into marshmallow (bottom of ear) half way and then insert the other end into the cupcake to hold ear in place. We tested 5 different muffin liners and it seemed that the firmer, thicker liners made rounder cupcakes and the thinner ones had flatter cupcakes. Depending on what you are decorating you might want a certain shape. We found red hots at Target which has a candy center where you just mix and match what candies you want to buy. Licorice strings are hard to find but make great whiskers. If you want finer coconut, or have a few long pieces, chop in a small food choppper or processor. If you are doing this activity with young children, then make the ears ahead of time.